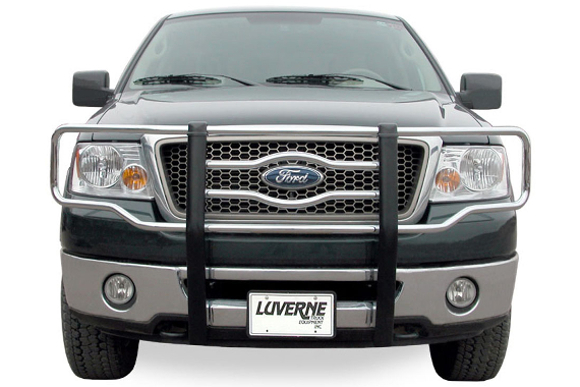 The LUVERNE 1 1/4" tubular grille guard adds style to your vehicle without reinventing its look. It is built with their signature center logo reveal and has a vehicle-specific ring assembly for a perfect fit. It features strong, frame-mounted uprights with bolted rubber extrusions for added protection, and it attaches with no drilling necessary for an easy installation. The look of every LUVERNE grille guard is centered around theirr classic logo reveal. They begin there because they know that you wear that badge with pride. The center tubes are bent to contour around your vehicle's logo, framing it in and giving it the attention it deserves. The side brush guards are also custom-shaped to contour to your headlights and better protect your front end. The LUVERNE 1 1/4" tubular grille guard is not only made to complement your style but also beef up your front end. Each one is made from a one-piece 1 1/4" steel frame and ring assembly to provide maximum strength, and the uprights bolt directly onto the frame of your vehicle for added rigidity. The grille guard also features extruded rubber covers and trim caps on the uprights to keep them well protected from road debris and the elements. Each LUVERNE 1 1/4" grille guard is made in the USA to ensure the highest quality for your vehicle. For the best possible fit and an easy installation, all LUVERNE 1 1/4" tubular grille guards are designed to be vehicle-specific. This eliminates the need for drilling during the install and allows the factory tow hooks to be used on certain models. High-strength steel mounting brackets are used to bolt the grille guard into place, and the brackets feature a durable black powder coat finish for long-lasting dependability.